The other day I was talking to someone about sugar cravings and she shared that she will have something savory right after having something sweet and this will help her to stop wanting more sugar after enjoying that one piece. For me, if I drink a tall glass of water, this often this helps. There are so many different strategies to try to curb our sugar cravings–some simpler than others–but the problem is that cravings always come back. After doing a bit of research, I’ve identified 5 nutritional reasons why you could be craving sugar and 5 realistic ways to shake the habit. See if you can identify with any or all of them. How many carbohydrates did you consume during your meal? If you just finished polishing off a bowl of pasta with sauce, then you're more likely to crave something sweet after your meal. To solve this problem, add some fat, fiber, or protein to your meal to satiate you and not leave you with the feeling of wanting more. To start, track how many carbohydrates you're currently consuming, then cut your consumption by at least 25%. So if you're currently eating 200 grams per day, cut your consumption to 150. This may go hand-in-hand with consuming too many carbs but is not always necessarily the case. Be sure your breakfast and lunch contain good servings of protein like eggs, chicken, tuna, or yogurts to help keep your body balanced and feeling satisfied. Your body may actually be dehydrated and craving water which may be mistaken for a sugar craving. Water will give you a sense of fullness and will also help your liver to function more efficiently; which will, in turn, help you to lose weight naturally. Give it a try first and see if it helps your sugar cravings. Remember, God has naturally designed our bodies to be in good health and naturally balance itself. Too much of one thing will cause imbalances in other areas. If you're craving sugar, it could be because you consumed too much sodium in your meal or previous meals. Take note of how much sugar you're consuming and try to keep it below 1500 mg. 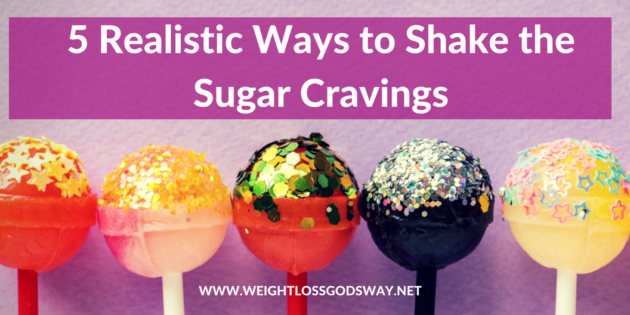 This can also trigger sugar cravings. In our attempt to lose weight, many of us restrict our carbohydrates too low. Also, if you find yourself always craving certain foods, it could be a sign that your body is in need of a particular nutrient. For example, craving chocolate can indicate your body's need for more magnesium. That can be found in foods such as raw nuts, dark green leafy greens, and legumes. If you're craving toast, it can indicate a need for nitrogen which can be found in foods that contain protein. If you're craving a particular food, do a bit of research to see if there is a nutrient that you may be lacking that is causing you to crave that particular food. So how many of these reasons applied to you? Eliminating sugar from your diet is a multi-faceted issue, but you can begin with the factors that are within your control such as eating foods that won't trigger the cravings. Please share in the comments section below if you can identify with any of these 5 nutritional reasons. Here's to your sweet life without sugar. Under the consuming too much salt section, in the last paragraph, did you mean salt instead of the word sugar for what we’re supposed to keep under 1500 mg? Yes I can most certainly identify with cravings after carbs. I know I probably eat more than my fair share of carbs and not enough protein. I have always assumed I was just out of control. It never entered my mind it could be a physical need of my. Since becoming diabetic feels like my body is out of wack. Very good message. Shows how to eat the right amount of carbs and the right ones.